A electron diffraction pattern of an amorphous specimen is typically a halo feature, while a diffraction pattern of a polycrystalline specimen shows well defined sharp Debye-Scherrer rings, indicating the presence of LRO in the specimen. Deng et al. analyzed plastically deformed Zr55Al10Ni5Cu30 metallic glasses using SAED technique in TEM (see Figure 3100a). 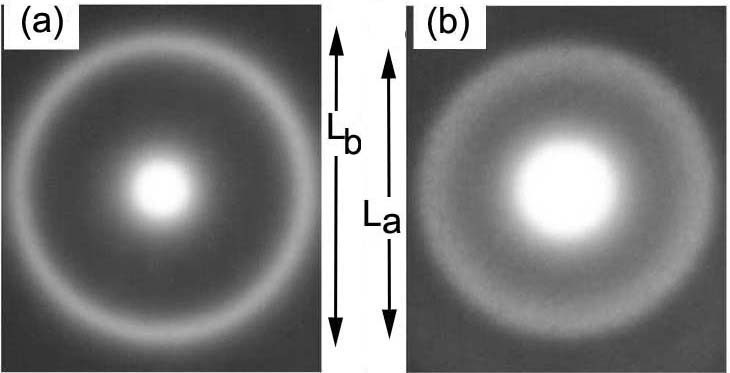 Although both the structures before and after plastic deformation process were in amorphous state, the diffraction pattern taken from the deformed specimen shows shrinkage (La/Lb = 0.87) and broadening of diffuse halo rings in the diffraction patterns. Those changes of the diffuse rings indicate the increase of interatomic spacing and/or free volume was induced by the deformation process. Figure 3100b also indicates that the Zr-Ni alloy is amorphous since the electron diffraction pattern obtained from this region is a halo. Deng Yu-Fu, Yang Fei, Yang Jian-Lin, and Zhang Wei, The increasing of localized free volume in bulk metallic glass under uniaxial compression, Chinese Physics, 16(7), (2007) 2051. Masahiro Kitada and Fumiyoshi Kirino, Effects of Sputter Order and Oxide Layer on Amorphous Formation of Zr-Ni Thin Film System, Materials Transactions, Vol. 46, No. 2 (2005) pp. 277 to 280.